This week marks the end of another wonderful rotation and so therefore also another baked good. As I said, I’m working on dermatology and I’ll have to say I’m spoiled. Not because I have the best hours (we work 11-12 hour days, there is a dermatologist shortage!) But I’m spoiled because I think I am working with one of the kindest, most cheerful and sincere doctors I have ever met, and I’m just not sure if my future rotations can live up to these high standards. Since I went home this weekend, I had the pleasure of going raspberry picking with my mom (and dragging John along), which opened a new world of recipe possibilities. Despite the fact that it was about 97 degrees, we had a lot of fun and came home with quite a loot of berries. I have come up with quite a few fun ways to put them to use, so consider this fair warning if you soon tire of seeing raspberry recipes on this blog. As far as I’ve heard raspberry season (at least in Ohio) doesn’t end until mid-October so go ahead and pick some berries for yourself – you won’t even have to suffer through the heat. About the bars themselves, I brought them in today, and they were a big hit. 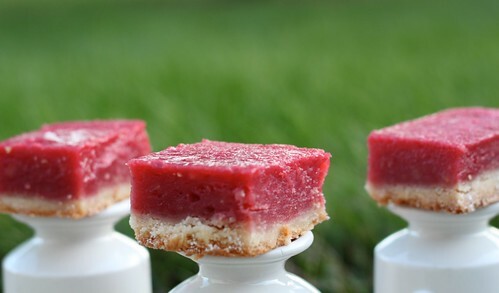 I described them as raspberry bars , and one of the nurses said, “They taste like raspberry lemonade!” I thought this was ironic because that was the actual name of the original recipe but she came up with that description de novo. If you notice this recipe requires a lot of juicing of lemons. I found this to be the most troublesome part, especially considering that after I had juiced 8 lemons I somehow managed to spill the entire cup of lemon juice all over myself. Since I didn’t have enough lemons to make another cup, I used some bottled lemon juice to make up the difference. They still tasted good but I wouldn’t recommend substituting all of the fresh squeezed lemon juice for the bottled stuff as it tends to be more tart. The other tedious part of this recipe is separating all those egg whites. If your wondering what to do with the leftover yolks, that’s easy – make ice cream! Of course you could also make traditional lemon bars if you want to skip the raspberry flavor all together, but I’m not advocating that. Makes a 13 x 9 inch pan. * Recipe can be halved to make an 8×8 pan, but will need a slightly reduced baking time. Add flour, sugar, lemon zest and salt to a large bowl and whisk to combine. Add the berries to a fine mesh sieve and mash through with a spatula to extract as much pulp and juice as possible, leaving behind the berry seeds. Add the raspberry puree, egg whites and eggs and lemon juice to the flour mixture and whisk until evenly mixed. Pour over the warm crust. Bake pan for 35-40 minutes until the center is almost set. Remove from oven and cool. Cover and refrigerate for at least 2 hours. Remove bars from pan using the parchment paper and run a sharp knife under water to slice bars. Sprinkle with powdered sugar before serving, if desired.